SpriteFontPlus is library that extends functionality of the SpriteFont. For now it has only one feature - ability to create SpiteFont dynamically from ttf. It could be used if one doesnt know exactly what character ranges are going to be used(it happens in games that use Asian languages). It's worth to note that SpriteFontPlus produces quite different result than stock MonoGame pipeline font baker. I have a high level of interest in this. As well as i known that others do, as this is something that has been talked about being added to mono game. Can this import multibyte unicode characters that equate to the loaded glyphs data ? To say does it represent glyphs with the equivalent possibly 2 character surrogate strings or utf32 character codes that might represent a surrogate pair unicode glyph. For example c# uses utf16 be to represent characters and can read high and low surrogates to represent them for a total of 32bits. However are current spritefont only reads in and represents glyphs with only a single 16bit character in its glyph dictionary meaning that the range of characters can only represent up to \u+FFFF while this is still a large range and even allows some emojis Hot Beverage ☕ U+2615. It omits much of what c# itself can actually store in a string and represent as a single glyph. 0xD83D 0xDCAC > &#128172; // 💬 < can be pasted into visual studio in a string. How does it handle point size ? Is that being drawn with SpriteBatch or with your own routine? In your second image the one with spritefont plus it appears that the text is not being kerned. There is space between many letters that appears to be a bit to much such as between the q u in quick and b r o in brown. Frankly I dont know answers to those questions. As SpriteFontPlus uses port of stb_truetype internally and I have poor knowledge about stb_truetype capabilities. It creates SpriteFont and renders it with ordinary SpriteBatch.DrawString. There could be bug with kernings, yes. It appears to not take into account high or low surrogates. this would need to be of the type. Preferably read into a string or char pair out of the font, then converted with char.ConvertToUtf32(char high, char low); To be also stored in a glyph dictionary of the <int, GlyphInfo> type the characters should be stored in the ttf i think in high low order. I suppose that it is necessary if it will be used with the current spritebatch. It would be great however to have a option to create a glyph with a string or uft32 equivalent of a glyphs high low surrogate pair. As well as the dictionary look up for it. Rewriting spritebatch at that point is no more then a couple lines of change and would allow access to all the higher unicode characters in a font including emojis naturally. /// Initializes a new instance of the <see cref="SpriteFont" /> class. However eventually SpriteFontPlus will gain its own font class, which will support utf-32. I made a test project that while it of course lacks a actual spritefont with a int glyph dictionary to read from. It has a two classes that might be of interest everything of real relevance is in game1. The other class is nearly the exact same except i dropped in some notes and code. That shows how you would convert the previous class to read a spritefont with a dictionary of utf32 converted and then draw them if it of had one which would be on your end. The classes are very small compared to the whole of spritebatch and are basically buffered simplistic versions of spritebatch e.g. you set the text and just keep calling draw on it over and over its really for a specific use but its good enough to demonstrate whats missing and the same changes applied to that second class can be applied directly to the actual monogame spritebatch. I.E. if you manage to make a spritefont with the int glyph layout were the int represents the surrogate pair glyphs. Then you nearly have a working test draw function in that second class, i say nearly cause of course i cant test it to make sure i didn't muck anything up. I put the unifont in there but it doesn't actually hold any double char surrogates i think even if it is huge. You would have to find a font that does i think some of the microsoft fonts actually do. // Matrix calculations unrolled. Only transformation and scaling occurs here the world matrix is set to handle all rotations proper. // This is a little test to see what ill later need to do if i want to actually buffer and batch like this. There can be some upsides to this and down as well. throw new Exception("improper string format the last character in the string is a defind as a high surrogate pair but there is no following character"); // probably will never happen. 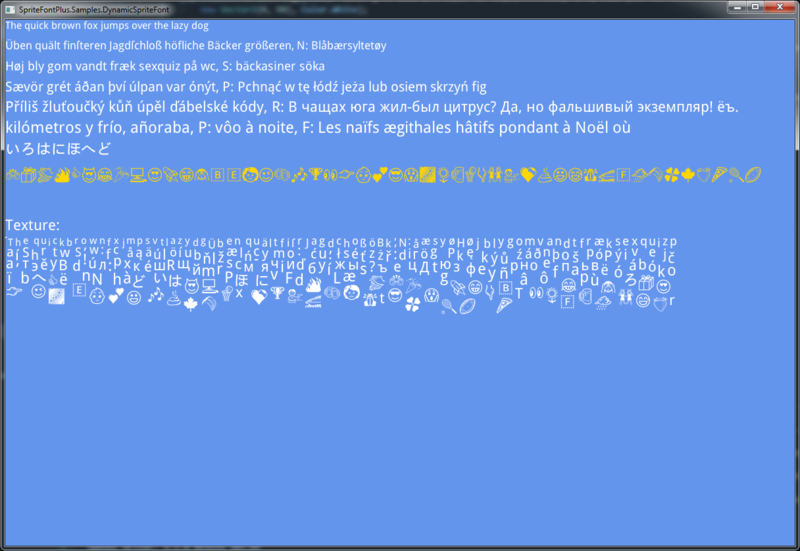 // in this way the glyphs can be indexed in a new type of spritefont that has loaded the ttf characters correctly. With a proper <int, glyph> dictionary to reference the glphys from. As shown this is the primary change that spritebatch needs but we don't have a spritefont type at the moment that is available to enable it. I skimmed over it breifly jjag i just didn't see what needed to be done on that end i have no idea were to even look for the font description. I really have avoided the content importing classes for the most part so im not familiar at all with it. Edit ok i have a rough draft alteration that pulls in full unicode support i tested this with the Symbolas font which supports most of the higher range unicode blocks. Here i pulled in the blocks shown under the image. Ill post back the alterations i made to your project as soon as i clean it up at least a little bit. It's basically using the spritebatch mockup i posted before to draw. Overall i think this pulls in and renders the glyphs better then the current importer spritefont uses. Expanded they look really good and don't have the bad alaising and transparency artifacts the current importer is producing on load. The ability to load the ttf's directly is really nice. It also opens up the possibility of dynamically loading system fonts to pull in just a needed character or character block. Which also leads me back to the idea that maybe a spritefont that holds multiple texture pages to cover a larger range of images per font and a drawstring that can use it, would be good. 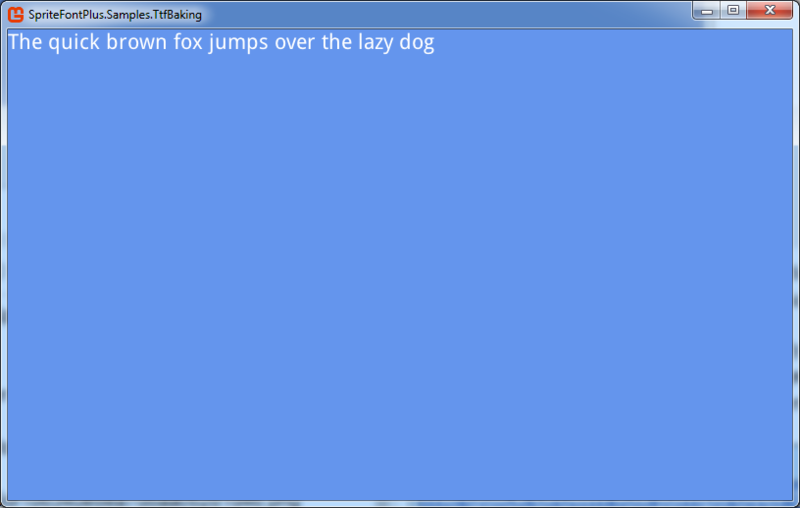 It could be ported to C# and added to the SpriteFontPlus. 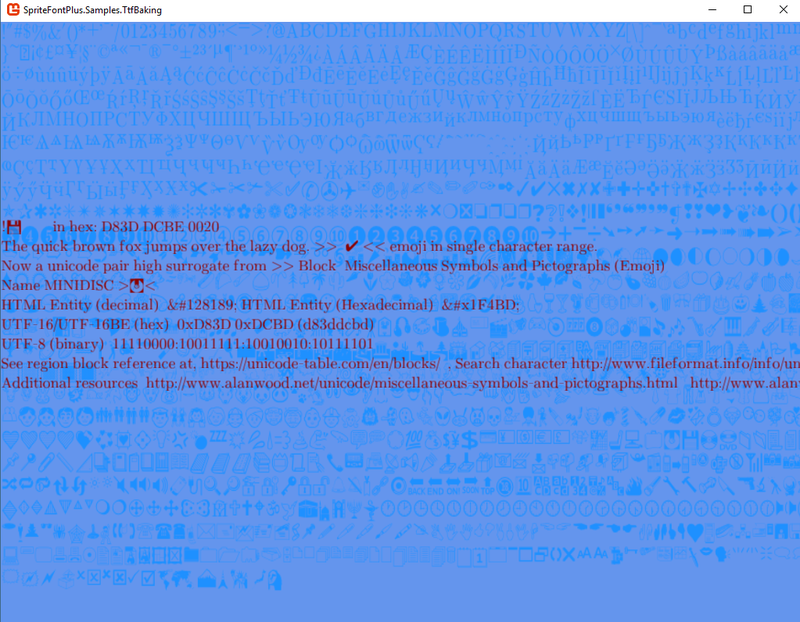 Well my little render here is just a hack in and its a little messed up but i did get the unicode working. To tired to post a pic i zipped up the whole solution just about everything i added is marked Unicode in the classes or methods. Its mostly just alternates of your current classes. I also added probably about three quarters of all the the en character regions with some comment descriptions for intellisense. Mostly skipped the individual language regions early on. 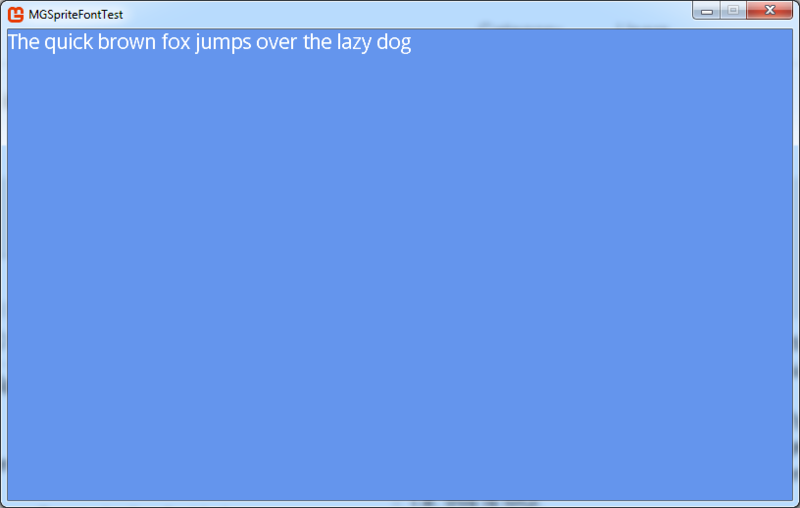 I've ported fontstash to C# and integrated it into the SpriteFontPlus. * New Feature: Added ability to create SpriteFont from AngelCode BMFont(only XML with single texture is supported for now).